We are pleased to present The Japanese Brownie - the latest addition to our acclaimed PALMER COX BROWNIE COLLECTION. This whimsical character made his appearance in Cox's Brownie book, "The Brownies Abroad", first published in 1898. Based accurately on the original Palmer Cox illustrations, the Japanese Brownie is made of the finest custom-made all-wool felt and jointed at the neck and shoulders. He has a molded felt character face, hand painted features, and tiny sculptural hands. Measuring 9" tall, the Japanese Brownie has heavy wire inside his legs to enable him to be self-standing. The Japanese Brownie is outfitted in a delightful period costume of Old Japan. His ceremonial kimono is made of wool felt with applied silk ribbons and decorative felt appliques in floral and nautical motifs. The kimono features contrasting aqua silk lining and an 'obi' sash around his waist. 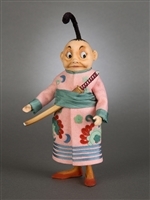 Final touches include tiny hand-cobbled silk slippers on his feet and a Samurai sword inside a carved wooden sheath. This authentically-detailed accessory is handmade at the RJW workshop especially for the Japanese Brownie. No detail has been spared to bring this amusing Palmer Cox character vividly to life! The Japanese Brownie is produced in a limited edition of 250 pieces worldwide. He comes inside a deluxe R. John Wright presentation box with a signed and numbered Certificate of Authenticity and the forms for owner registration. The Canadian character made his appearance in Cox's fourth Brownie book published in 1894 titled "The Brownies Around the World." Based on the original Palmer Cox illustrations, the Brownie Canadian from R. John Wright Dolls is made of the finest all-wool felt and jointed at the neck and shoulders. He has a molded felt character face, hand painted features, a mohair wig, and incredibly tiny sculptural hands. Measuring 8 1/2" tall (without his hat), the Canadian has heavy wire inside his legs to enable him to be self-standing. The Brownie Canadian is outfitted in a colorful outfit consisting of an all-felt greatcoat with felt covered buttons and sash, detailed mukluk boots, and a matching tassled cap. No detail has been spared to bring this amusing Palmer Cox character vividly to life. The Brownie Canadian is produced in a limited edition of just 250 pieces worldwide. He comes inside a deluxe RJW presentation box with a signed and numbered Certificate of Authenticity and the forms for owner registration. Subject to availability, the matching-number service will be provided to other pieces in the Palmer Cox Collection. This whimsical character was a late arrival to Cox's Brownie series. He was added to the troops at the specific request of then-President Theodore Roosevelt! Based accurately on the original Palmer Cox illustrations, the Brownie Cowboy is made of the finest all-wool felt and jointed at the neck and shoulders. He has a molded felt character face, hand painted features, a mohair wig, and tiny sculptural hands. Measuring 9" tall, the Cowboy has heavy wire inside his legs to enable him to be self-standing. The Brownie Cowboy is ready for the roundup wearing a traditional "deerskin" costume made of felt with fringe trim. His tall hand-cobbled leather boots feature custom-made metal spurs. Atop his head is a large-brimmed cowboy hat and as a wonderful added accessory, the Cowboy's leather holster carries his custom-made six-shooter. No detail will be overlooked to bring this amusing Palmer Cox character vividly to life. The Brownie Cowboy will be produced in a limited edition of 250 pieces worldwide. He will come inside a deluxe R. John Wright presentation box with a signed and numbered Certificate of Authenticity and the forms for owner registration. Matching numbers to previous Brownies in the series are provided subject to availability. This whimsical character made his appearance in Cox's first Brownie book published in 1887 titled "The Brownies, Their Book." Based accurately on the original Palmer Cox illustrations, the Brownie Jockey is made of the finest all-wool felt and jointed at the neck and shoulders. He has a molded felt character face, hand painted features, a mohair wig, and tiny sculptural hands. Measuring 9" tall, the Jockey has heavy wire inside his legs to enable him to be self-standing. The Brownie Jockey is ready for the races outfitted in his authentic jockey uniform consisting of a pieced felt cap with a leather brim and chinstrap, a tailored felt shirt with custom-cast brass buttons, and felt jodhpur breeches. His tall hand-cobbled boots are made of the finest top-grain calfskin and in one hand he holds his detailed riding crop made of wood and leather. The Brownie Jockey will be produced in a limited edition of 250 pieces worldwide. He will come inside a deluxe R. John Wright presentation box with a signed and numbered Certificate of Authenticity and the forms for owner registration. Subject to availability, the matching-number service will be provided to previous pieces in the Palmer Cox Collection.